Turquoise was popular this summer, but I still have several necklaces and bracelets left. Turquoise and coral look great together. Gold with turquoise is an unusual combination that is sure to stand out. Bracelets $25 each. Earrings $ 10 and $8. All have been SOLD. October is breast cancer awareness month. Show your support with something pretty and pink. 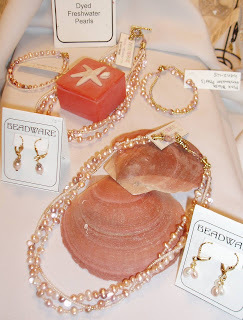 These are a mix of pink dyed and white freshwater pearls, assorted pink, gold, ivory and crystal seed beads, pink and clear Czech crystals and gold plated accents and findings. The triple strand necklaces are $45, bracelets $20 and matching earrings are $10 and $8. All have been SOLD.